In the morning when I get up to go shoot I am notorious for arriving early and leaving late. I always like to measure my time, enjoy the moment, get in the zone, sum up the waves, the sky, the light and find the best spot to start with. Never being to set in my ways to move for a better angle or break. My sweet spot for light is usually just after 1st light of the morning until the sun crests over the horizon. Within that time frame there is approx. a 30 to sometimes 40 minute window to photograph and then the light is gone and what I mean by gone is that it gets to harsh for my type of photography. That doesn’t mean I don’t push the boundaries of shooting later as I stated earlier I stay to long and 99% of those shots go in the trash because of the harsh lighting conditions. During that time of shooting I try to make every moment count. The light changes fast and you never know what you are going to get with the rising sun and a different angle. Golds, purples, blues, greens, yellows, reds, oranges…yes as the light changes so do the colors. So when it comes to making every moment count what I mean to say is “you need to pay attention”. Looking down at your replay of shots could mean you miss the best ones of the session with the wave break and lighting. There is always time to look at your shots after your done because really the shoot only lasts 30 minutes or so, so you need to make hay while the sun isn’t shining. I have enclosed 4 shots in this blog with time stamps so you can see the emphasis on the limited time you have. Image 1 is time stamped at 06:11:10, Image 2 you will notice is time stamped at 06:11:40 only a mere 30 seconds time difference and the light has changed considerably. A mere 3 minutes and 35 seconds later you get image 3. The silver and blues have given away to yellows and purples and as the sunrises 21 minutes and 15 seconds later those colors have given away to the blue pastels of Image 4. Eventually the sunrises and the nice tones of color and light is gone because the light changes the surface of the water to harsh contrasts. But as you can see the entire session lasted 25 minutes and 30 seconds. As soon as there is enough light to shoot it is gone in a flash to too much lighting and the session is done. Imagine 25 minutes and you are already packing up and heading to the car. Consider the consequence of looking at your rear view finder and scrolling through the last 20-50 shots. How much opportunity have you missed? So make the moments count because time is fleeting. A few things I have learned: I shoot in Shutter Priority because my shutter speed is the most important thing to get the motion I desire. I also set my ISO setting to auto until there is enough light then I set it to ISO 50 knowing that shooting at slow shutter speeds the camera can over expose quickly when your F stop has been maxed out to its smallest size. You can use ND filters but they give off a warm hue that I really don’t like and don’t want to spend the time in photoshop correcting. I have previously shot with a tripod but with better lenses comes better image stability. It is also said that practice makes perfect so with practice of panning I now shoot handheld which gives me way more mobility. 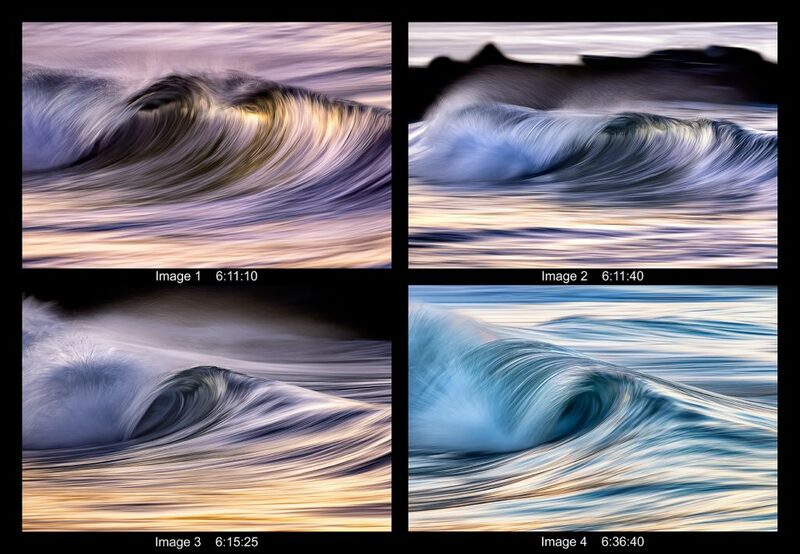 If you are looking to shoot wave photography depending on your style plan ahead, know your equipment and prepare your equipment the night before. Arrive early to plan your attack and find the best spots. Watch the surf reports so you know where to go for the best results. Also, know where to stand once you are on shore. The last thing you want is to get toppled by a big wave and sucked out. Salt water is terrible for your camera equipment and can ruin thousands of dollars worth of equipment in a heart beat. For me, it is all about the motion and the limited time I have per session so I make the most of every second because the conditions change and are gone quickly. If there is one thing I love about shooting at sunrise it is the light that is different with every angle and every second that passes. The peace and quiet doesn’t hurt either. Ever been out at sunset and every person with a cell phone that walks by is telling you how to compose your shot? You don’t get that before dawn because most of the time it is just you.